The United States is facing a health crisis of epidemic proportions: children are gaining weight younger and faster than ever before. With the prospect of becoming the most obese generation of adults in history, they are already turning up with an alarming assortment of "grown-up" maladies, from type 2 diabetes to high blood pressure. This book takes a clear-eyed look at what's behind the statistics and diagnoses, and what can be done about the major health crisis among American children. 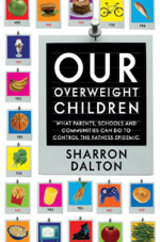 Sharron Dalton begins with the basics: what obesity is, what causes it, and why it matters. Integrating information from scientific and popular sources, she reviews past remedies and their results and compares specific strategies and programs for children. When a third of our children are overweight or likely to become so, it's everyone's problem—and this book argues for a united approach, promoting the role of parents, health professionals, and school and community leaders. For each group, Dalton outlines actions to combat the epidemic. She suggests ways for parents to respond to their children in interactions centered on food and physical activities. And she illuminates a number of issues raised by childhood obesity, from the pain of fat discrimination to the economic, social, and political ramifications of an epidemic of obesity among the young. At once authoritative and nontechnical, no-nonsense and compassionate, Our Overweight Children is a clear call to action—a prescription for treating the most dire problem threatening our children's health and our nation's future. Sharron Dalton is Associate Professor in the Department of Nutrition, Food Studies, and Public Health at New York University. She is the editor of, most recently, Overweight and Weight Management: The Health Professional's Guide to Understanding and Practice (1997).